A few days ago, my boss arrived to the office with a box full of assorted squash that she had picked from her garden. She admitted neglecting the overgrown weeds in and around the produce and to her surprise, had found a plethora of ripe, fresh squash that she couldn’t possibly eat on her own. She placed the box on the reception desk with a note encouraging employees to take whatever we wanted. I was elated and quickly rummaged through the produce looking for the best of the bunch. I guess the hardest part of this recipe is getting the thick skin off of the flesh. Carefully use a knife to trim away the light colored skin keeping the cut side of the squash flat against the cutting surface. Scoop out the seeds and cube the firm flesh. In a short while, get ready for a fantastic side dish! Preheat oven to 350 degrees. In a large bowl, toss cubed squash and olive oil until well coated. 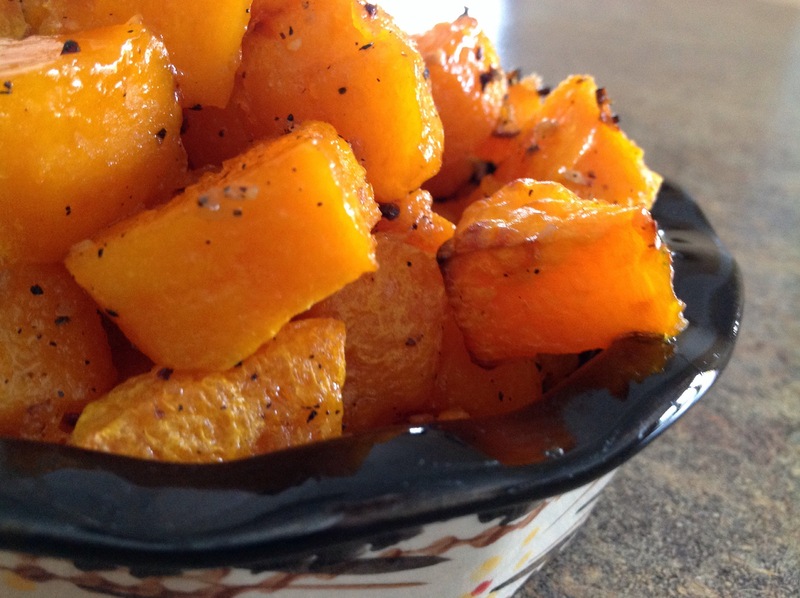 Arrange squash on an 11X17″ baking pan and sprinkle with salt and pepper. Bake for 20 minutes until golden brown and slightly caramelized. Remove from oven and sprinkle evenly with brown sugar; return to the oven, continue baking for 5-7 minutes or until fork tender. I love squash and this looks so yummy! Oh, it tastes as great as it looks! Hope you get a chance to try it sometime. This looks yummy! I am looking forward to trying it out! Let me know how it turns out! Thanks for your comment and have a great day! Simple and delicious and efficient! 😊Thanks for your comment, Charlotte! Thanks, Jen… They really are yummy! Pierce the squash with a fork, cut off the ends and microwave for 3.5 minutes, take out and let cool for a second or two, your squash will skin easily. This recipe was so easy to use. Thank you so much! You’re quite welcome. My family really enjoys this recipe. And it’s quite simple. I didn’t microwave mine. I think the oven carmelizes the squash and deepens the flavor. Hi Linda, thanks for visiting my blog. I love butternut, because it is so versatile. Your recipe looks delicious! Well, thank you… The recipe is easy and delicious! Thanks for stopping by! I love butternut squash, definitely a must try for me! This recipe couldn’t be any easier… Little effort, big flavor! Thanks for stopping by! And butternut squash is very easy to work with as well, I’ve never had any fights with squash, in comparison to other vegetables…..
Teehee… Have a great day!